Ugh, I’m 6 days into the new month and nothing to show for it on the blog. It has been a bit busy around here at Intrigued as of late and not sure it is going to calm down anytime soon. Case in point, yesterday at 6:15pm local time I was standing at the arrival doors for Punta Gorda airport. It had just poured there and I was taking a few minutes to stretch the legs out from the 2.5 hour or so flight down there from Springfield IL. – where I had driven 1.5 hours before that to make the flight from my hometown. The stretch was important because I was getting into my father’s van so my brother (who had made an earlier flight) and I could drive him back … nonstop. At 1:00pm this afternoon we rolled into Springfield where we unloaded the van and then I made it out to the airport to drive the 1.5 hours back here. All that makes for one tired Bri. No complaints though, always happy to help out my Dad and being in a vehicle for that long you get to re-live some great memories and strengthen the family bond. Thought I would relax a bit before heading to bed early for some badly needed shuteye – I struggle to get any naps in while on the road so the deprivation keeps building throughout the trip. The best way for me to relax is to sit in my den, watch some Cardinals and talk about Team Bird. Although today’s featured bird is more of Yankee fan than a Card. Hit the Jump to read about this new bird on my list. 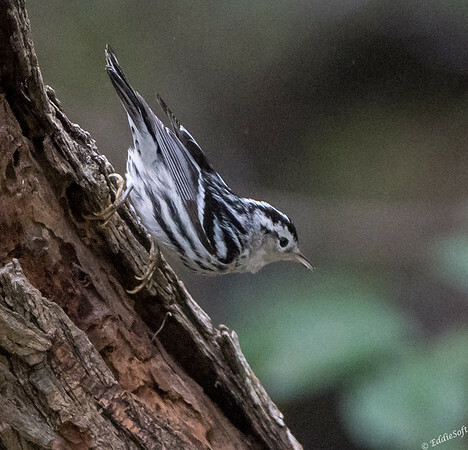 This Black-and-White Warbler comes to you courtesy of The Valley Nature Birding Center in Weslaco Texas. Yes, I am still draining all the bird fodder that came from our trip down the Texas Gulf Coast and Rio Grande Valley last January. I found this little gem of a birding place thanks to Birding Trails Texas Gulf Coast birding book Linda gifted me a few Christmases ago. Jim Foster authored this comprehensive guide back in 2014 and pretty much puts a bow on all the places worth birding in that region. Each trip to Texas I try to find a few new places to check out and that is why I found myself in a parking lot of a city park wondering why in the hell this would be a good birding spot. There was your standard park elements (tennis courts, playground etc.) and then pretty much surrounded by subdivisions and merchants/warehouses. Not optimistic, I recommended Linda stay with the dogs while I did a quick run up to investigate what looked like a visitor center. Besides, the dark clouds that had gathered starting spitting at us. First thing I noticed, is the visitor center was a lot larger than I expected – it was tucked in the corner of the park. A helpful ranger gave me some background and alerted me to the fee – sign said 4 dollars – she charged me 2. Did take the time to let Linda know that I was going in and I had to pay to see what it was all about – an investment that was WELL WORTH it. Turns out they let you out the back doors of the visitor center which leads you into 6 acres of absolutely perfect birding ecosystem. I’d say roughly two hours later I returned and had to explain what took me so long – there is nothing more cherished than a wife who understands a birder. The clouds and the deep foliage made for some difficult shooting conditions – my ISO was pushed to pull my targets out of the darkness of the overgrowth – hello grain. Regardless, I was able to get something in the tin even though the encounter of this new bird lasted a total of 10 seconds. A flying Zebra darted past my head and landed on a nearby tree. I turned and was able to get the barrel of The Beast on target. Compensated a bit more for the ever darkening sky and snapped a total of two pictures before this Warbler was gone like the Hamburglar finally getting his hands on some fries. I do have a few really nice shots of a bare trunk of a tree if anyone happens to need that ha. This is not the first time I have encountered this bird, although it is the first set I have found time to process – the other was with Ron up in the Magic Hedge at Montrose Point in Chicago (we still have to get all of those birds identified and posted – looking like a +13 for that trip). Thanks to that earlier encounter, was pretty sure on the ID of this bird – did verify with Cornell where I learned the narrow black band behind the eye means this is likely a juvenile. Adults have larger patches. One stunning bird to experience in the field. One might even imagine it carrying around a small ball and chain based on its feather palette. Some quick facts about this now official new bird to my list. First off, the B&W is the sole member of the Mniotilta genus which means moss plucking. One of this Warbler’s characteristic behaviors. Although we found it in its Wintering region, the B&W hangs out in Canada during the Summer along with a slicing band that extends from Texas up through Maine. I always strive to get a bird’s signature behaviors in the tin. Failed on this one based on Cornell mentioning that these convict painted Warblers are rather mean to any intruders in their space. There were clearly a number of birds roaming around, yet there were no deliberate aggressions with any of them. Just flew in, looked around quickly and took off. Oh, I also didn’t get the moss plucking 0-2. Lastly, these Black-and-Whites have beefier legs and an extended hind claw than the other wood Warblers – you can get a feel for that in both the pictures above – I shall call it KFG Warbler for now on (Kung-Fu Grip). Eyelids heavy now so calling it a wrap – hope you enjoyed reading about my new addition! You are becoming quite the birder! We are in the backhalf of the Warbler migration so a lot of the colorful Warblers are finishing up their trek northward. Told my wife I am just too impatient to wait for them to come through – I went to their winter playland instead ha. Glad you enjoyed and as always thanks for stopping by and commenting. That flying zebra must have been blown way off course to make it there! Paula (who commented above you) had mentioned the Dutch are extremely active when it comes to new birds so I can imagine the hoopla when this decided to make a brief visit. By the way, you now have me scanning the flowers while out birding looking for butters – going to have to take more digital cards out in the field with me. Thanks for dropping by and sharing your thoughts! These are beautiful birds, which is surprising considering they are color-free. I didn’t know that about the narrow black band behind the eye indicating an juvenile, or the larger rear talon (wow, it DOES look big). 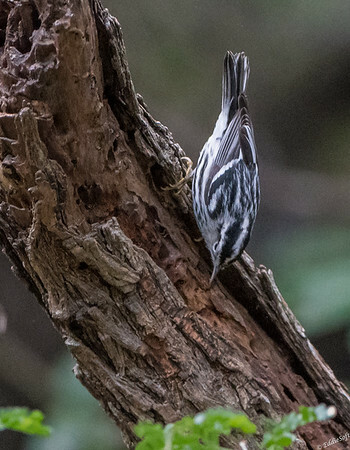 But unlike other warblers, I would mention that they often are facing downward on trunks like Brown Creepers or full upside-down under branches poking around (looking for moss?). Thanks for the cool pics–I don’t see any grain! I think when you have white feathers on birds like these or on Great Egrets, etc., it’s best to have a gray day so the contrast doesn’t blow out the whites or lose the black end of the histogram, and in this case you ended up with rich, warm photos, which is really nice. Ah, was just commenting on your comment in the next post on how we need to get through that Montrose shoot. Amazing place for sure and had a great time trying to get all those Warblers in the tin. Also found the other birders up there to be extremely helpful pointing out interesting specimens and helping us identify some of the ones we were not sure of. In fact, we even scored some major Warblers on our second trip up there… which .. wait for it … wait for it … also need to get processed. Wow, we are really behind and those shoots will give a big boost to my number… and yours of course so I won’t gain anymore ground. I think the blog posting images hide some of the grain deficiencies because of the auto-reduction that occurs (I do not put the full size version up to speed up your rendering. I agree the drabbier days will make a colorful bird pop especially if it is in high contrast to the surrounding colors like the white on this one. I’ll have to check on that Kestrel observation – I really haven’t noticed that before. As always thanks for swinging by.